The material on this page is excerpted and adapted from the book "You Have Died of Dysentery", by R. Philip Bouchard, available on Amazon. What??? I can only carry 100 pounds of meat back to the wagon!?! And why do those dead buffalo stick their legs straight up in the air? Have you ever wondered how the designers of the classic versions of The Oregon Trail came up with decisions such as these? If so, then you have come to the right place, because I was there when those features were designed – and I am about to spill the secrets. In 1984 I was given the assignment to help create a completely new version of The Oregon Trail. The text-based version of the game had already been around for more than a decade – but in all that time the game had never been substantially modified, much less redesigned from the ground up. But that was about to change. MECC, the publisher of the game, was ready to replace the aging product with something completely new, and I was selected to be the team leader and lead designer for the project. Each time that a shooting opportunity arose, the player was instructed to type “BANG”. If the player typed quickly and accurately, then his shooting would be successful. In a hunting situation (as opposed to shooting at bandits, “hostile riders”, or wolves) this meant that the food supply would increase. Each time that the player chose to go hunting, a picture of a deer would creep very, very slowly across the screen. Each time that the deer reached the right edge of the screen, it would reappear at the left edge. Each time that the player pressed any key, a cluster of 8 bullets would creep very, very slowly up the middle of the screen. Oddly, the right time to fire the gun was when the deer was about to disappear off the right edge. 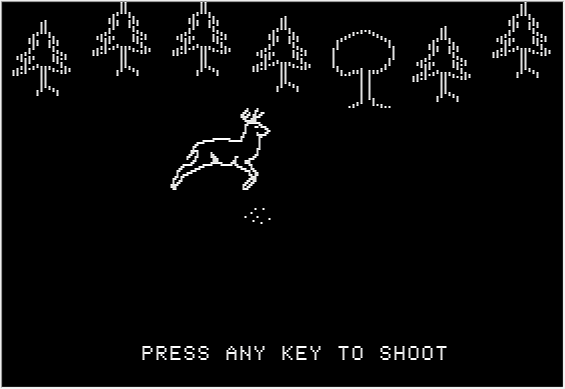 If the player was lucky, then the deer and the bullets would meet in the middle, as shown above. Except for the shooting activities, the 1980 game was still text-based, essentially unchanged from the original timeshare version. Despite the peculiar slow-motion nature of the activity, hunting was by far the best known part of the game, and the main reason that many kids (especially boys) enjoyed playing the game. Therefore, even before we began work on the brand new version of The Oregon Trail in 1984, it was assumed that the product would include some sort of hunting activity. I knew that this part of the game would get a lot of use as well as critical scrutiny. Because MECC would sell the new game in both the home and school markets, it was clear that hunting would need to be a highly engaging activity, with a lot of gameplay value. But I also wanted to include some subtle educational lessons, particularly with regards to the geography of the West. I soon decided that my goal was to design a hunting game that provided a sense of actually going out into the landscape and hunting for animals. I wanted the player to be able to see the landscape – whether it was prairie, mountains, desert, or whatever. This was quite a challenge on the Apple II, which had only six colors and a fairly low resolution. I also wanted the hunting to be somewhat difficult for the first-time hunter. The hunter would need to go hunting several times before he or she mastered the skills needed to be successful. Right from the beginning of the project, I frequently brainstormed with my teammates to discuss possible approaches for the hunting activity. At first, I invited all of my teammates – and anyone else who was interested – to participate in the brainstorming. After enough ideas had been generated, I pared down the participants to a “kernel” of three people – myself, Bob Granvin, and John Krenz. The three of us rapidly sorted through the ideas and picked a clear direction to pursue, along with some of the key features. We were initially puzzled as to how to present the landscape, given that I wanted the landscape to be different with every play of the game, but I also wanted the landscape to reflect the geography of the player’s current location on the trail. I brainstormed various possibilities with the team, including Charolyn Kaplinger, the graphic artist. Eventually we settled on an abstract minimalist scheme, in which the hunting game occupies the entire screen. Much of the screen is black, but scattered around the screen are objects – rocks, trees, clumps of grass, etc. – that indicate the current landscape. Furthermore, each of these objects presents an obstacle to the player. You have to walk around a tree or a large rock – you cannot walk through it. By this time we already had doubts that the hunting game could be created using Applesoft BASIC – the programming language that we were using for the rest of the product. Most other companies out there – especially companies that specialized in pure entertainment games – created their action games in assembly language. However, before giving us permission to program the hunting activity in assembly language, my supervisor first wanted to see the results if we attempted to program it in BASIC. So Bob Granvin created a BASIC prototype, minus the animals. The prototype was helpful in demonstrating the concepts that we had in mind, but even without the animals the prototype was too sluggish to be practical. What species of animals will we include in the game, and where along the trail will each species be encountered? What are the algorithms for the animal behavior? Can they move in all 8 directions? Can they move at different speeds? What triggers a change in speed or direction? How many geographic zones will the program include? What landscape features will we include for each zone, and how will those features be arranged on the screen? How long does each hunting session last? What happens at the beginning and end of each session? Does any data appear on the screen during the session? When the main Oregon Trail program hands control over to the hunting module, what data does it need to pass along? What data does the hunting game pass back? While I set about answering these questions, I left it to Roger and Charolyn to collaborate on the details of the animation – such as how many phases (distinct images) to use in the animation of the animals. And I left it to Roger and John to collaborate as to what parts of the Apple II memory that Roger could use, based on John’s technology plan. However, as Roger began to build the hunting activity, we soon ran into a problem. Each type of animal required 10 graphic states (4 animation phases plus the dead state, with each of the 5 facing both left and right). 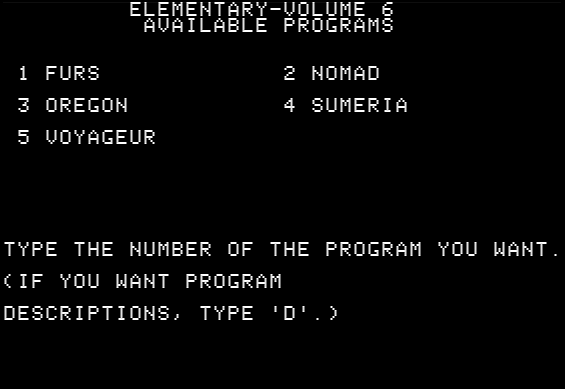 Therefore, for 11 types of animals, we needed to load 110 animal graphics into the computer’s memory – which was not possible, due to the limited space available in an Apple II. We attempted several different solutions to the problem, but none worked. Finally I reduced the animals from 11 types to just 6, and we reduced the animation from 4-phase to 3-phase. Now we only needed to load 48 images into memory, instead of 110. It was still an extremely tight fit, but we managed to cram it all in. Surprisingly, the new 3-phase animation actually looked better than the 4-phase animation, but we felt sad to limit the game to just 6 types of animals. 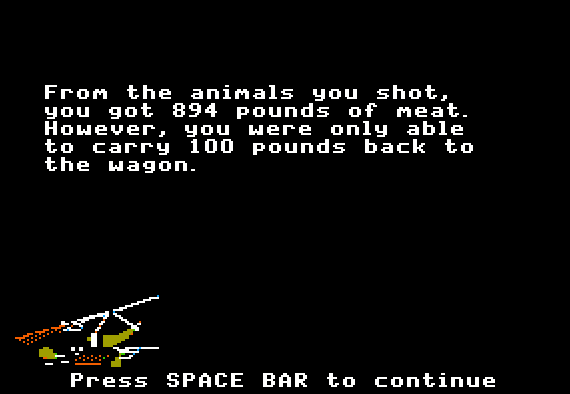 One of the most controversial design decisions I made is familiar to everyone who has played The Oregon Trail. You go out hunting, and you shoot a bison. Maybe you shoot two or three bison. As the hunting session comes to an end, the screen tells you how many pounds of animals you have just killed. Then you see “However, you were only able carry 100 pounds back to the wagon.” Some people see this as a brilliant touch, while others see it as absolutely stupid. It has certainly frustrated more than one player of the game. When we tested the product with kids, this feature inspired a lot of discussion. I could see the kids thinking about the consequences of their actions. 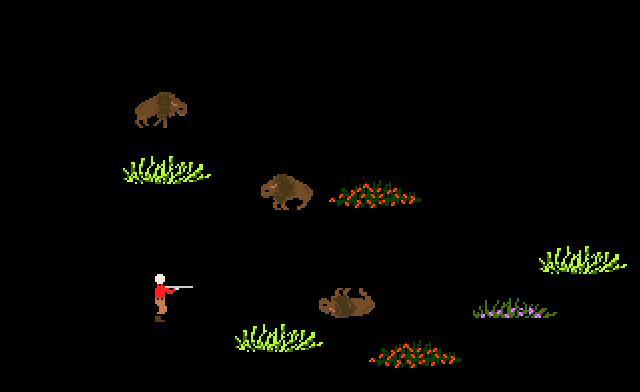 Some of the kids became exceedingly conscious of the waste, and many of them decided that they would never shoot more than one bison when they went hunting. Another controversy I faced was the difficulty of the hunting game. Many adults who played the game told me that hunting was too hard, and that I should make it easier. Even my supervisor told me this. But to me, it was exactly the right difficulty. In real life, people who pick up a hunting rifle for the first time are not instant experts. It takes some time to learn how to use the rifle effectively, and it takes some time to learn how to find and stalk the animals. All of this is especially true if the person is using a gun similar to those in use in 1848. When we did the user testing with kids, I saw that they struggled with hunting at first, but many of them developed a keen proficiency quite quickly – sometimes after only 3 or 4 hunting trips. 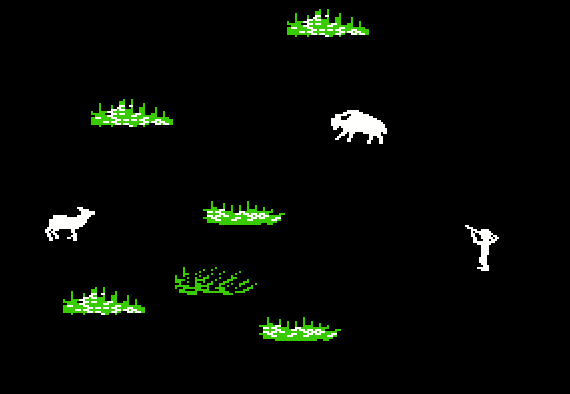 In fact, the hunting interface I designed was no more difficult than the typical arcade-style games then available on the Apple II. 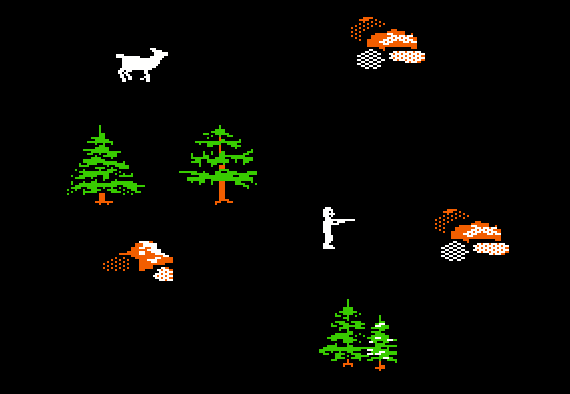 The hunting game was specifically intended to be in the genre of an arcade game, and to be comparable to other arcade-style games. I didn’t want to dumb it down just because some adults were having problems with it. Despite the pressure, I kept resisting the requests to make the hunting game easier. And I’m glad I did. 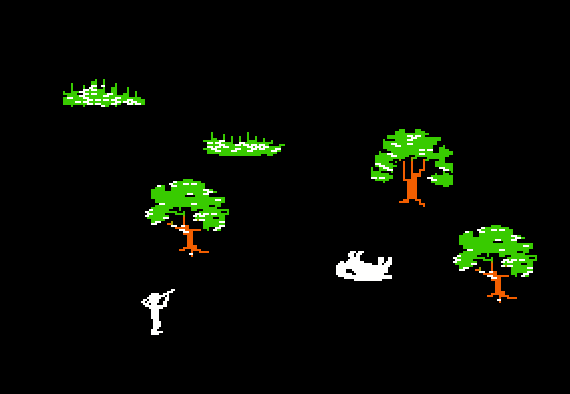 Literally millions of kids eventually played this hunting game – and most of them enjoyed it very much. If the game had been less challenging, then it would not have been as much fun. The upshot is that an entire generation of kids grew up playing the 1985 design – either on the Apple II, the IBM, or some other computer. It is also the edition that originated nearly all of the details and memes that people associate with The Oregon Trail. As a result, illustrations on the internet of the “original” Oregon Trail game always show the 1985 design, rather than the original text-only version.